Hundreds of thousands of Halloween revelers are expected to flock to Santa Monica Boulevard in West Hollywood for the 2010 West Hollywood Halloween Costume Carnaval (see entertainment and event schedule) on Halloween night, Sunday, October 31, 2010, from 6 p.m. to 11 p.m. along Santa Monica Boulevard from Doheny Drive to La Cienega Boulevard. The large crowd will be arriving in many automobiles, and with street closures for the event compounding what would already be a massive traffic problem, it’s best to plan ahead and arrive early for the event. Residents of West Hollywood using street parking should be aware that permit parking will be suspended, and you may have trouble finding a parking spot for your vehicle if you vacate one leading up to or during the event. While permit parking will be suspended in West Hollywood, other regulations will remain in effect. In addition, those parking on public streets in neighboring Beverly Hills or the City of Los Angeles should be aware that all parking regulations, including permit parking requirements, will be enforced. These cities may also be stepping up enforcement or implementing special parking rules on streets adjacent to West Hollywood. Santa Monica Boulevard between Doheny Drive and La Cienega Boulevard including all side streets from 12 p.m. Sunday, October 31 through 6 a.m., Monday, November 1, 2010. Almont Drive and La Peer Drive are closed from Santa Monica Blvd to Melrose Avenue from 12 p.m., Sunday, October 31 through 6 a.m., Monday, November 1, 2010. Robertson Boulevard between Melrose Avenue and Santa Monica Boulevard from 12 p.m., Sunday, October 31 through 6 a.m., Monday, November 1, 2010. San Vicente Boulevard between Cynthia Street and Melrose Avenue from 12 p.m., Sunday, October 31 through 6 a.m., Monday, November 1, 2010. Santa Monica Boulevard between La Cienega Boulevard and Holloway Drive/Croft Avenue from 4 p.m. Sunday, October 31 through 6 a.m., Monday, November 1, 2010. La Cienega Boulevard between Sunset Boulevard and Santa Monica Boulevard from 4 p.m., Sunday, October 31 through 6 a.m., Monday, November 1, 2010. ***Northbound La Cienega Boulevard is open between Holloway Drive and Sunset Boulevard. Sunset Boulevard eastbound and westbound turn lanes onto La Cienega Boulevard from 4 p.m., Sunday, October 31 through 6 a.m., Monday, November 1, 2010. The City of West Hollywood will suspend permit parking for the Halloween Carnaval from 5 p.m. Sunday, October 31, 2010 to 6 a.m., Monday, November 1, 2010. Meters will be enforced. 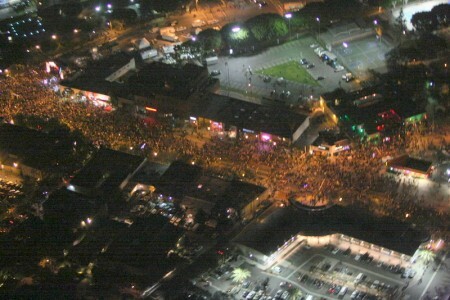 Carnaval-goers are asked to observe the boundaries of West Hollywood. If parking occurs in the City of Los Angeles, all parking restrictions must be observed. The City of West Hollywood will be offering a CityLine service on Halloween during, the usual hours of 5:30 p.m. to 12:30 a.m. The route will operate along Santa Monica, Boulevard between La Cienega Boulevard and Fuller Avenue. An article devoted to parking.